We have wide array of CPVC ball valves in different designs according to their application. Usually CPVC ball valve are used to stop the water and chemical supply in pipe line. these are available in diffrent sizes with different features. 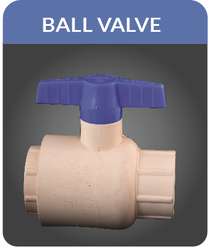 Looking for CPVC Ball Valves ?